Hello there, relatively young millennial with your first real job looking for a sporty coupe! You might have had your eye on a Subaru BRZ or Toyota 86 for the “balance” and “handling.” Forget that noise. What you need in your life is a lightly used BMW 2 Series coupe, which are incredibly cheap at the moment. The 86, BRZ and recently discontinued FR-S are sporty cars for people who like to have fun when they drive. They are also apparently for people who like to buy sports cars only to get dusted a minivan, as our friends from Cars.com will illustrate in the video below. I don’t care how good the handling is, you don’t want to be hosed in a drag race by a Chrysler Pacifica. The good news is it doesn’t have to be this way. 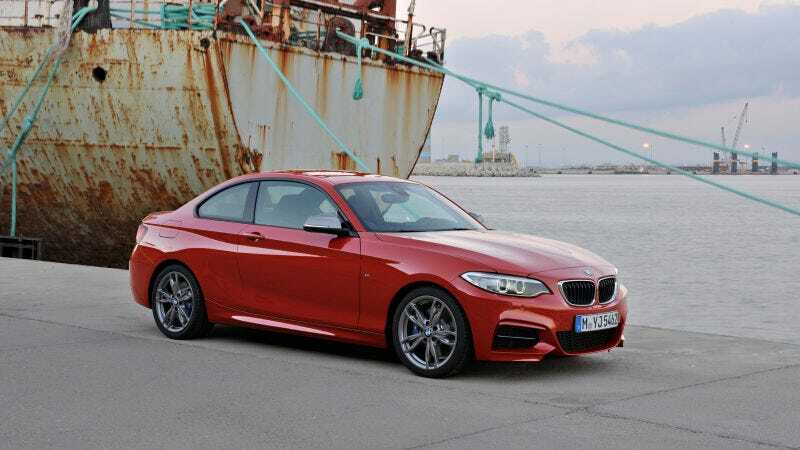 Despite some recent news about BMW potentially killing both manuals and DCT gearboxes in their future M-models, the 2 Series is a small coupe that’s good enough to still be called the Ultimate Driving Machine. And perhaps due to the waning coupe market and insane demand for SUVs, used 2s are dirt cheap. For $20,000, that means glorious rear-wheel drive and 240 horsepower from a turbocharged four-cylinder engine, much like the one that Toyota and Subaru will never give you. Now if you want a three-pedal version of the 228i, that is going to cost you a little more, as the inventory is a bit limited for manual cars. However, a Toyota 86 has a starting price of over $27,000. For the same amount of money, you can have yourself a 2014 228i with a six-speed manual and only 10,000 miles. Or let’s say you want to go nuts and get a fully loaded Subaru BRZ with the performance package with an MSRP of just under $30,000. A fine choice, but similar money can buy you a low-mileage, 300 HP M235i with a twin-turbo inline-six and enough sauce to trash a lot of far more expensive sports cars. Now, this is the point where you make some comments about “warranties” and “reliability.” I got news for you, friend-o—you aren’t keeping this car forever. You’ll pick up one of these coupes and hang on to it for two or three years max, then life will dictate something more practical. Most of the BMWs will still be well within the coverage period for that ownership time.